1. The Cavern was based on a Parisian left bank club called: “Le Caveau”. The Beatles played there 275 times between 9th Feb ’61 and 3rd Aug ’63. 2. Brian once offered the Beatles £50 each a week for life (but no more) as part of a proposed deal. George’s response was: “No thanks Brian – we’ll risk it”. 3. Ringo is Japanese for Apple. 4. The reason the Beatles used an Austin Princess on tour was because the doors were large enough to walk (or throw yourself) through vertically as well as horizontally. 5. Paul was not the first to leave The Beatles, he was the last. Paul was the first to publicly announce it. The First Beatle to leave the band was Ringo on 20th August 1968 just after ‘Yer Blues’, he then went on holiday on Peter Seller’s yacht. He returned on 03rd September 1968. Then George on 10th January 1969, returning on 15th January on the proviso of no tour. When he quit, he packed up his guitar saying “See you ‘round the clubs”. 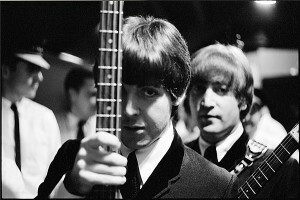 John’s response was “We can get Eric Clapton in” – perhaps to paper over George’s overall reaction to Yoko. Yoko then went to George’s chair and began to sing. Then John quit on 13th September on the plane to Totonto. Klein told him not to announce it. He did at a board meeting on 20th September, but it was hushed up.